This acorn squash ravioli was on the first One Dinner menu in November. What can one chef do with one ingredient? Let's find out. That's the gist of Inland Northwest Food Network's new One Dinner series, which features multi-course dinners from six regional chefs on a bimonthly cycle through October. The first dinner held in Coeur d'Alene last November featured locally grown, organic winter squash, a darling of the garden until one has more of it than recipes for its usage. Local chef and restaurateur Adam Hegsted, however, had plenty, using it in tzatziki over beef kebabs, as a chutney with baked Brie, in a salad, as a noodle, in a granita and in a delicious pumpkin pie. 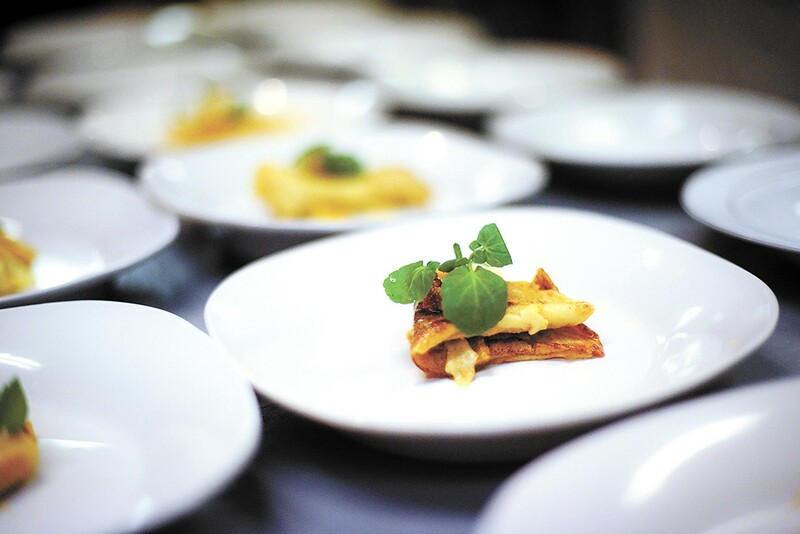 "My favorite dish was the acorn squash ravioli with brown butter and warm feta," notes inaugural One Dinner attendee Jennifer Fisk, who also liked the family-style setup of the event, and Hegsted's explanations about the food. Fisk hadn't previously attended one of Inland Northwest Food Network's event, but has since also gone to one of the nonprofit's monthly "Drink This" events, a class at Up North Distillery in Post Falls. "We attended [One Dinner] because we are foodies and love trying new and unique experiences," she says. Hegsted, whose growing restaurant brand Eat Good Group includes Gilded Unicorn and the forthcoming Incrediburger & Eggs (see page 32) in Spokane, along with Farmhouse Kitchen and Silo Bar in Sandpoint, was a natural choice to produce the inaugural dinner. "The [Inland Northwest] Food Network is a really good fit for us because it does everything we do," says Hegsted, who has helped shape the region's food climate by building community through local food-focused events such as Crave Northwest food festival, which he founded in 2017. "We can't donate $10,000," says Hegsted, who also serves on the Food Network's board, "but we can help raise $10,000" through support from Eat Good's businesses. The chef has hosted previous fundraisers for various organizations at his Kendall Yards restaurant Wandering Table, for example. The restaurant's name and concept found its start as a traveling supper club that in 2010 preceded the pop-up dining phenomena that continues to permeate the regional food scene. For the next One Dinner event, Spokane chef and restaurant owner Tony Brown, of Ruins (and the former Stella's Cafe), has signed on to showcase grains in an eight-course dinner on Feb. 1. "We're really trying to build a cuisine that is uniquely Northwest," and that highlights ingredients that grow well in the region, explains Inland Northwest Food Network Founder Teri McKenzie. "Hopefully by doing events like this we can point people in the right direction for how to use and where to get these great products," adds Brown. Brown, who's known for his improvisational (and often rotating) menu prowess at Ruins, is still working out the dinner's details, including specific dishes and whether or not the dinner will be held at his current location or a new venue he's planning to open later this spring. He is, however, sure about his collaborators: Don Scheuerman from Palouse Heritage farms, Culture Breads' Shaun Thompson Duffy and Snacktivist Foods' Joni Kindwall-Moore, whose company specializes in gluten-free and vegan mixes. 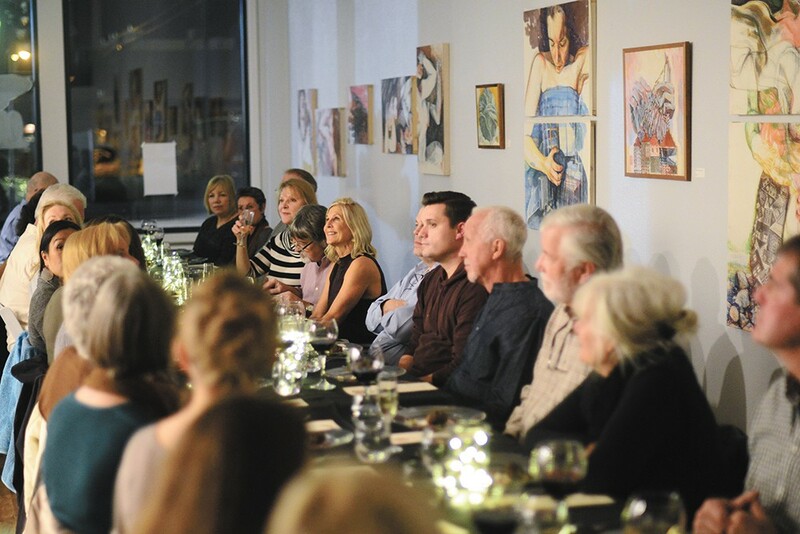 Guests of the series' first dinner enjoyed a squash-themed menu by Chef Adam Hegsted. The major details for this year's remaining One Dinner series are mostly set except for October's chef and ingredient. In April, chef Laurent Zirotti of Fleur de Sel will showcase eggs from EGA Farms out of Edwall, Washington, at an elegant dinner in the Post Falls restaurant he runs with wife Patricia. Zirotti will draw from his French heritage to create traditional dishes like egg en meurette (poached eggs in red wine) and ile flottante et oeufs a la neige, also known as Floating Island, a dessert of egg meringue atop an island of custardy crème anglaise. He also plans to prepare the more modern 63-degree egg, slow-cooked to perfection. Spokane-based chef Jeremy Hansen (Santé Restaurant & Charcuterie, Common Crumb Artisan Bakery, Biscuit Wizard, Inland Pacific Kitchen and two forthcoming spots at the Ridpath) has signed on for June, while Travis Dickinson, formerly executive chef of Clover, and who's soon opening his own downtown spot Cochinito Taqueria, will tackle August's event (featured ingredients have yet to be selected for both summer dinners). Money raised from the One Dinner series supports Inland Northwest Food Network's various programming, including a book club, cooking classes, nutrition-oriented activities for kids, meet-your-farmer events and other efforts, such expanding more of its footprint into Spokane, adds nonprofit director McKenzie. Although the network originated and is based in North Idaho, it's experienced increased regional interest in its mission of "connecting people, place, food and farm." Although nothing comparable to the Inland Northwest Food Network exists in Spokane, Hegsted says he believes the organization's overall mission cares little about the boundaries of cities or towns or even states. "I see it as a regional identity," says the chef, who operates restaurants in both Eastern Washington and North Idaho. Palouse Heritage uses four terms to describe grains: landrace, heritage or heirloom, and ancient. Landrace grains are the oldest cultivated varieties — wheat, barley, rye, oats and others — that existed prior to modern industrial methods designed to increase yield, resist pests and improve shelf-life. Examples include spelt and Persian khorasan. Heritage or heirloom grains refers to pre-1950s varieties, including some post-1900s grains that have been hybridized through modern methods. The original print version of this article was headlined "One on One"